Amazon is combing the country looking for the next city to conquer for its headquarters, but the discussion around that larger, flashier pursuit is hiding some of their worst behavior. At around $12 an hour, 40 hours a week, full-time jobs pay higher than many others in the region, and the benefits are also better than many other jobs in the industry. But workers are required to be on their feet all day, and receive scant time for bathroom breaks or lunch. They’re pressured to meet certain production goals and are penalized by getting “written up”—the first step in getting fired—for not meeting them, they say. They’re also allowed very little time off, and written up if they go over a certain amount of time off, these workers say, even if they get sick. 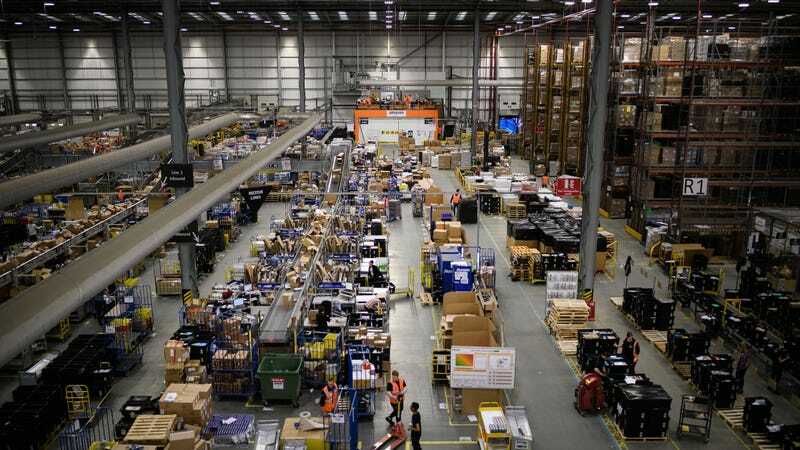 Jobs at Amazon’s warehouses are tiered unofficially by level of desirability. A “picker” finds the Tide Pods you ordered and tosses it into a bin, searching through a warehouse’s shelves while being timed by a scanner. A “stower” grabs items shipped to Amazon and puts them on the shelves. “Packers” take your Tide Pods from the bins, puts them in a box and packs them, throwing them on a conveyer belt and doing it all over again. These jobs are monotonous and physically demanding enough as it is, but the added pressure to complete these tasks in a certain amount of time means that people are breaking themselves to work faster and faster. A man in the “stow department” at an Amazon facility told Semuels that Amazon once randomly changed the time workers had to perform their tasks, creating a “Hunger Games” scenario that pits employees against each other to work faster for no reason other than ensuring Amazon’s global dominance. The scanners that workers rely on for instruction will often blare messages from corporate to “work faster.” If these admonishments do not work, Amazon tries some other tactics. They’ll run competitions such as a “Power Hour” in which workers are encouraged to work as hard as they can for a prize. One recent prize was a cookie. Another time, the winner of Power Hour would be entered into a raffle to win a gift card. “I don’t want a cookie or a gift card. I’ll take it, but I’d rather a living wage. Or not being timed when you’re sitting on the toilet,” said the man, who lives with his father because he and his girlfriend can’t afford their own place, and didn’t want his name used because he hopes to get promoted at Amazon. Not everyone who works at Amazon in the shipping and fulfillment departments has the same experience; Semuels also spoke to some people who managed to climb the ladder up into management, making the coveted and seemingly-impossible move from hourly employee to full-time. But many of the people who Semuels spoke to don’t make it past a year. Amazon’s shady labor practices would be resolved if Amazon workers unionized, but any attempts to do so have failed. Cities across the country whose economies have been in the toilet for decades are offering tax rebates to Amazon to get them in there and to provide jobs for their people; Amazon is gladly taking these offers and providing said jobs. They’ve also quietly patented a terrifying wristband that tracks the wearer’s every move. Read the full piece at The Atlantic here.